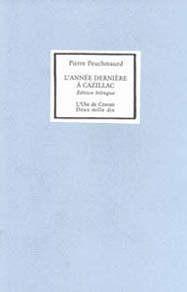 Bilingual edition (french-english). For the first time a book by Pierre Peuchmaurd, one of the greatest french poets of the last 50 years, is available in english. This text is one of the rare proses that he wrote, a bitter-sweet self-portrait as a man at a crucial moment in his life written with all the means of an extraordinary poetical sensibility. Tranlated by Benoît Chaput with the help of Gabriel Levine and Valerie Webber. Pierre Peuchmaurd was born in Paris in 1948 and died in Brive on april 12th 2009. He lived and wrote as a continuator of the great surrealist voices : through poetry. Collection "Le fer & sa rouille". 12.5 x 18 cm. 40 uncut pages under a Gauloises blue cover. Two hundred ten copies hand sowed in Montreal in april 2010 of which two hundred general copies were numbered from 1 to 200 and ten copies numbered from I to X where set aside for family and collaborators.